Explanation: Have you seen a bright evening star in the western sky lately? That's no star, that's planet Venus the second "rock" from the Sun. Blazing at -4.6 magnitude, Venus, after the Sun and Moon, is the third brightest celestial body in planet Earth's sky. Venus is closer to the Sun than Earth and as Venus orbits the Sun it is seen to go through phases similar to the Moon. But unlike the Moon, as Venus waxes and wanes its distance from Earth and hence its apparent size changes drastically. This causes Venus to look brighter as it looms large in its crescent phases than when it is smaller and nearly full. Taken on January 28th, this dramatic picture finds a crescent Venus near its brightest to the right of a crescent Moon. The brilliant rivals seem poised above a satellite dish of the Scripps Satellite Oceanography Facility. 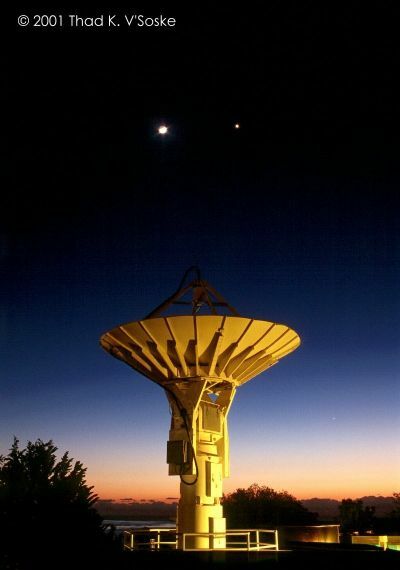 Closer to the horizon, just below and to the right of the satellite dish, Mercury pierces the twilight glow.